Put the diced mango in a small saucepan with the sugar and lime juice and zest. Cook over a medium heat until the lime juice has reduced slightly and become syrupy, transfer to a bowl and leave to cool. Mix the cooled mango and lime mixture with the condensed milk (reserving a few spoonfuls to decorate the top of the ice cream later), it should thicken slightly after a few minutes. Beat the cream to soft peaks then add the coconut milk and condensed milk and mango mixture, beat again to soft peaks. 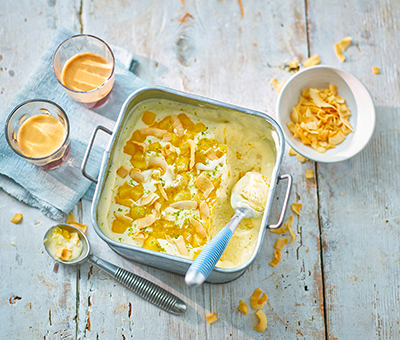 Pour the ice cream into a shallow, freezable container, top with the reserved spoonfuls of mango and lime and toasted coconut flakes to decorate. Freeze until solid (about 3-4 hours or overnight). To serve leave at room temperature for 5-10 minutes before serving in ice cream cones! Once frozen use within one month. Why not serve topped with passion fruit and lychees when in season?